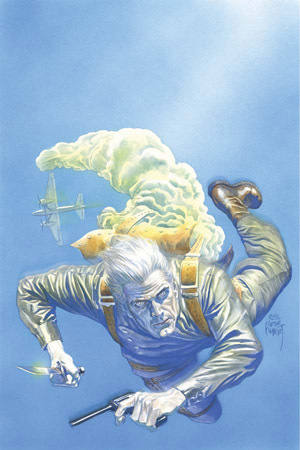 Alex Ross, the industry's preeminent painter, honors the work of all-time master Joe Kubert with this stunning depiction of The Avenger, and what better way is there to commemorate this tribute than with a super-rare virgin variant, free from pesky distractions? In this issue, meet Richard Henry Benson--the Avenger! His pallid features forever deadened by a criminal act, he is the ultimate master of disguise and uses his skills to mete out retribution to those who would prey on the innocent! But can even Benson triumph over an Invisible Man...? Fan-favorite writer Mark Waid - who is hotter than ever thanks to his work on Daredevil and Star Wars: Princess Leia - brings his personal favorite pulp hero back to comics with all-new, explosive adventures!